The space shuttle Atlantis, the last of NASA's winged orbiters to fly in space, goes on public display at the Kennedy Space Center visitors complex Saturday, the centerpiece of a $100 million facility designed to show off the spaceship as it appeared in orbit, with its payload bay doors open and robot arm extended. 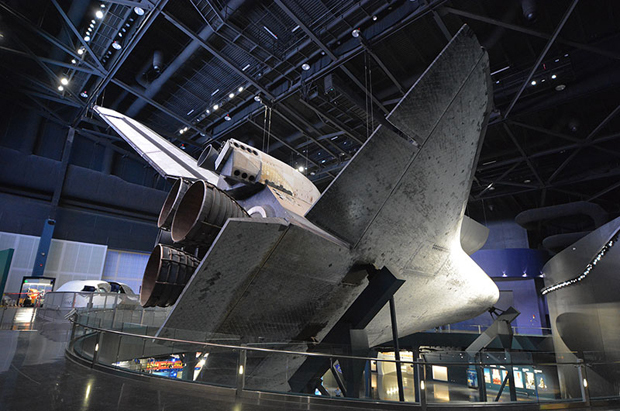 Mounted more than three stories above the main floor and tilted 43 degrees to one side, the shuttle can be viewed from below, giving visitors a look at the shuttle's black heat shield tiles and sweeping wings, or from a balcony level that extends almost into the open payload bay. "It is awesome! It is spectacular," said Bob Cabana, a four-flight shuttle veteran who now serves as director of the Kennedy Space Center. "We showcase Atlantis, but it tells the 30-year history of the shuttle program and the amazing team that made it all happen. I think we display Atlantis like no other orbiter, and folks are going to get to see it as only a very few have on orbit. It truly looks as if it's flying in space." For former shuttle workers and astronauts, the display showcases one of America's greatest technological triumphs, giving the public a chance to see an orbiter from a perspective few were able to enjoy when the ships were flying to and from low-Earth orbit. "This is an unparalleled experience," Tom Jones, a former shuttle astronaut who made four trips to space, told CBS News during a pre-opening walk through. "Here is the whole shuttle story, wrapped up in some history, you get eye poppingly close to the real space shuttle machine and then you go experience it yourself (in a shuttle simulator ride)." 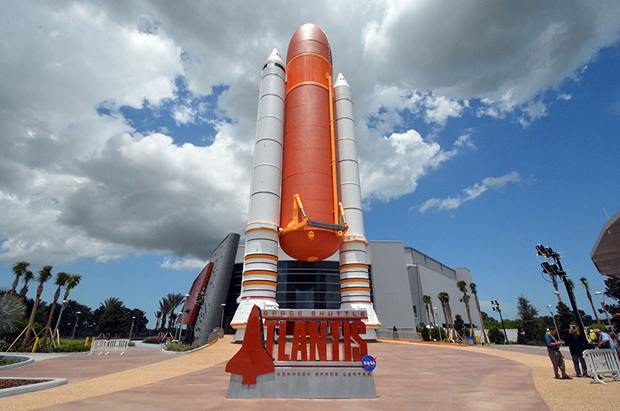 More than 60 interactive exhibits are part of the display, including a full-scale mockup of the Hubble Space Telescope, shuttle landing simulators, a shuttle main engine, space station docking simulators and a station mockup designed for kids. "It's got all the angles covered, and I think it's going to be a tremendously successful experience, educational and inspirational," Jones said. But the display also prompts sadness among former shuttle workers, who see Atlantis and its sister ships, Discovery and Endeavour, as viable, state-of-the-art manned spacecraft that were retired before their time, with no replacement vehicle waiting in the wings to take over. "I was sort of hoping this interval between the shuttle retiring and the next vehicle would just be a couple of years," Jones said. "But the budget just hasn't shown up, and I think it's one of the great missteps of our nation in space this decade, to let this slide on to 2016, 2017, 2018. We can do better. We should." But for Savannah Curry, a New Mexico tourist visiting the space center with her parents, seeing Atlantis during a pre-opening walk through was an eye-opening experience. "It's really interesting to get to see something like this," she said. "I didn't really grow up knowing a lot about it, and it's a lot of fun learning about everything that happened and how they had to go through such a long process to be able to develop the technology they did. I didn't expect any of it to be this big!" For Andrew Heiss of North Carolina, "it was incredible, seeing it in real life. Added his wife, Nancy: "It's breathtaking!" The enthusiastic reactions of school kids is especially pleasing to Cabana. "It will capture the imagination of another generation, it will continue to inspire as it starts off on its second mission in life. It was a phenomenal spaceship, it helped us explore and discover, and now it's going to lead a mission of inspiration to future scientists, engineers and explorers. It's absolutely fantastic." 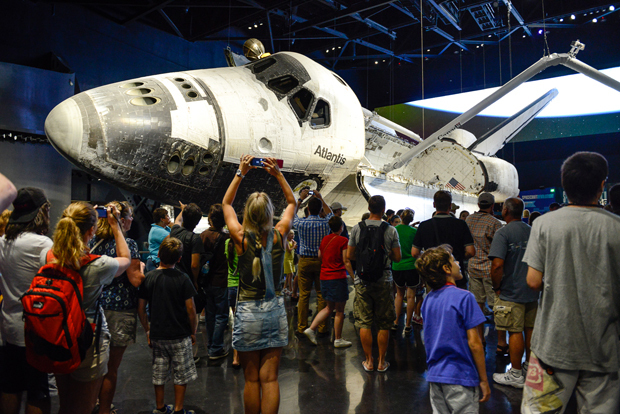 Atlantis completed NASA's 135th and final shuttle mission with a landing at the Kennedy Space Center on July 21, 2011. The shuttle spent more than a full year in space during its 33 missions, logging 125,935,769 miles over 4,848 orbits. Well before Atlantis returned to Earth, NASA managers decided where the agency's three space shuttles would end up on display. The shuttle Discovery, NASA's oldest surviving orbiter, was first to depart, leaving the Kennedy Space Center atop a 747 transport jet in April 2012, bound for Smithsonian Air & Space Museum's Steven F. Udvar-Hazy Center at Dulles International Airport outside Washington. The prototype shuttle Enterprise, used for approach and landing tests in the late 1970s, was moved from Dulles to the Intrepid Sea, Air & Space Museum in New York City where it went on display in July 2012. The shuttle Endeavour was flown to California that September and hauled through the streets of Los Angeles to the California Science Center. Atlantis was the last orbiter to be prepped for display, rolling out of the Vehicle Assembly Building at the Florida spaceport for the last time in November 2012. Mounted atop a wheeled transporter, Atlantis was moved into its unfinished home at the Visitors Center. The 90,000-square-foot building then was closed in behind the orbiter. Covered in protective shrink wrapping, the 150,000-pound shuttle was carefully jacked up 36 feet above the main floor and tilted at 43.21 degrees. After the shrink wrapping was removed, engineers carefully opened the ship's cargo bay doors, secured by cables to the roof, and installed a replica robot arm that extends out over the viewing balcony. Atlantis' three main engines are represented by real nozzles, but the engines themselves, normally hidden inside the shuttle's aft compartment, are absent. Likewise, the plumbing in the shuttle's forward and aft maneuvering system rocket pods was removed as a safety precaution because of the toxic propellants once routed through the lines. But those modifications are not visible from the outside and to the visitor, the orbiter looks almost exactly like it did in space during its final flight. "I'm very proud," said Tim Macy, director of project development and construction for Delaware North Companies Parks and Resorts, which operates the visitors complex. "Rolling it over here was a difficult task, opening those payload bay doors in one G (gravity) caused a lot of teeth gnashing and hand wringing," he said. "So here we are, with all these things we'd never done before. But you know what? A lot of smart people came together, we had NASA help, we had help from the guys at (shuttle contractor) United Space Alliance, we had our own engineering teams here locally and a couple of really clever people who fought really hard to maintain what we wanted to do." The display is "a once-in-a-lifetime opportunity," he said. "Even people who worked on the shuttle have never seen it like this." To make sure the spaceplane remains in pristine condition over the years and decades ahead, Delaware North hired a Washington company, Conservation Solutions, to develop a long-range plan that included wireless sensors throughout the shuttle to monitor humidity and temperature. "We spent a little more time and effort coming up with a conservation plan than I thought we would," Macy said. "I underestimated that, but I'm really, really glad we did what we did." So is Jones. Looking at Atlantis, remembering his own flights, he said the engineers who designed the shuttle could not have known what their creation would accomplish over the three-decade life of the program. "I think the engineering team on the space program didn't realize how hard a job they were taking on," he said. "And they just did it. They pulled off just a coup with a vehicle that could fly for 30 years and still be unexcelled by any other country or space faring nation and yet when the ship retired, it was still at the top of its game." He said the shuttle "was a tremendous classroom in space. It taught us how to do complex operations in orbit over those 30 years. The designers of the shuttle could never have imagined the complexity of putting a space station together, all the spacewalks, all the Hubble (Space Telescope) repairs, all the intricate work people accomplished in space using the shuttle as a platform. "If it didn't hit its costs or economics targets, if it didn't hit its safety standards or aspirations, it still taught us so much about being sophisticated in our work in space. And I think we can use that experience to really catapult ourselves out to do significant things around the moon, the asteroids, in the next 10 years." Delaware North put up more than $30 million to pay for Atlantis' new home, according to the Florida Today newspaper. Another $62.5 million came through a Bank of America loan backed by Space Florida, the state's aerospace development agency.